Reminiscent of Miami’s neon tones. 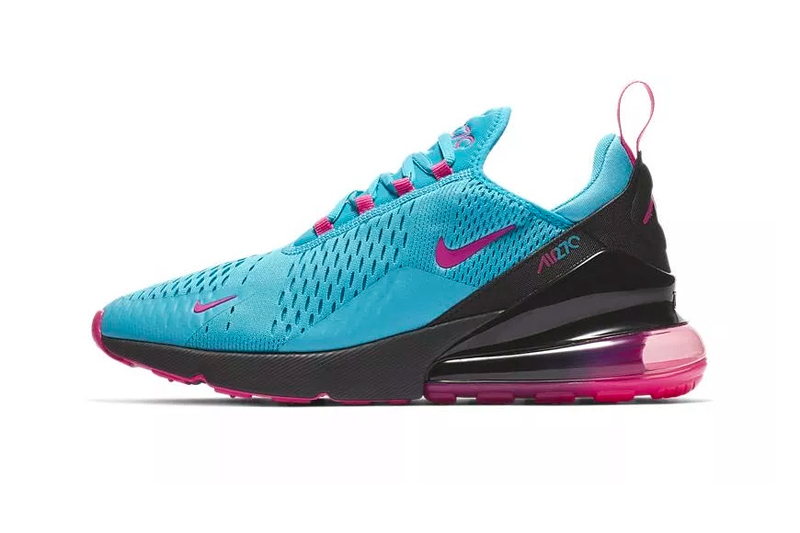 After getting a look at a “South Beach”-looking React Element 87 colorway, Nike is preparing to drop an Air Max 270 done in the familiar turquoise and pink color scheme. This time around, the lifestyle focussed AM model features a turquoise mesh base that’s accented by matching heat overlays and a contrasting black heel panel. The contrasting color of pink comes in the form of lace loops and branding found on the toe, midfoot, tongue, and heel. Finishing up the design of the latest “South Beach” look is a hybrid sole unit with a translucent pink external Air bag heel paired with a black, lightweight foam forefoot sole. Priced at $150 USD, the Air Max 270 “Blue/Pink” is set to release on nike.com and at select retailers this February. In case you missed it, the Air More Uptempo 720 continues Nike’s series of hybrid sneakers. Nike's Air Max 270 Cleans Up in "Black/Beige"
Reminding viewers of his heinous crimes. Harleen Quinzel has a new hairstyle. Limited to 1,500 bodies and 500 Summicron-M 50 f/2 lenses worldwide. Travis Scott & DJ Khaled Show Off Unreleased OVO x Air Jordan 4 "Paint Splatter"
Teasing a potential release for the model’s 30th anniversary? Off Boogie’s ‘Everythings for Sale’ debut studio album. Asking for a declaration of his contract rights.